I would really appreciate it if someone could put me into suspended animation for the next few months and wake me up on November 5th. Thanks very much. Crovitz confuses AN internet with THE Internet. Taylor was citing a technical definition of “internet” in his statement. But I know Bob Taylor, Bob Taylor is a friend of mine, and I think I can say without fear of contradiction that he fully endorses the idea as a point of personal pride that the government-funded ARPANet was very much the precursor of the Internet as we know it today. Nor was ARPA’s support “modest,” as Crovitz contends. It was full-throated and total. Bob Taylor was the single most important figure in the history of the Internet, and he holds that stature because of his government role. …. [Vinton Cerf and Robert Kahn] did develop TCP/IP–on a government contract! 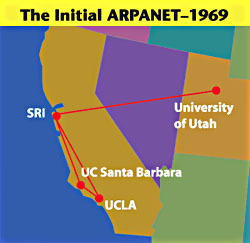 And Berners-Lee doesn’t get credit for hyperlinks–that belongs to Doug Engelbart of Stanford Research Institute, who showed them off in a legendary 1968 demo you can see here. Berners-Lee invented the World Wide Web–and he did so at CERN, a European government consortium. ….As for Ethernet, which Bob Metcalfe and David Boggs invented at PARC (under Taylor’s watchful eye), that’s by no means a precursor of the Internet, as Crovitz contends. It was, and is, a protocol for interconnecting computers and linking them to outside networks–such as the Internet. And Metcalfe drew his inspiration for the technology from ALOHANet, an ARPA-funded project at the University of Hawaii. So the bottom line is that the Internet as we know it was indeed born as a government project. In fact, without ARPA and Bob Taylor, it could not have come into existence. There’s more, and you should probably read the whole thing. But here’s what I really don’t get: Crovitz isn’t just wrong, he’s wrong in a laughably obvious way. No one who knows the first thing about the development of the internet would buy his story. It would be like some liberal writing a column suggesting that it’s a “myth” that Democrats were responsible for widening the Vietnam war. So why would Crovitz be willing to write something so publicly and embarrassingly false? I don’t know. But that’s where we are. It’s become almost a game, with conservatives one-upping each other with ever more ridiculous claims to see just how far they can go. The answer, apparently, is pretty far. It’s now so important for conservatives to claim that nothing good has ever come out of the federal government that they’re literally willing to say anything. After all, how many of Crovitz’s readers will ever read Hiltzik’s response? One percent of them? Mission accomplished. NOTE: One of the things that gets me about this nonsense is how one-sided it is. Can you imagine a liberal writing a column claiming that private industry played virtually no role in the development of the internet? I can’t. We often cite the internet as an example of government support for basic research and infrastructure, but we’d never pretend that private industry didn’t play a big role too.